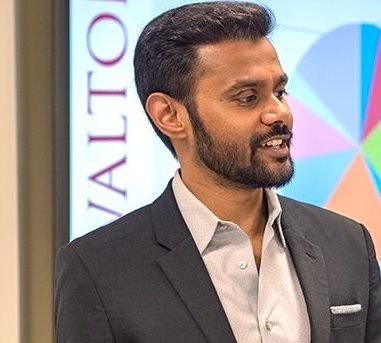 Mervin Jebaraj has been named director of the Center for Business and Economic Research at the University of Arkansas Sam M. Walton College of Business in Fayetteville. He will officially take on the role Jan. 1. Jebaraj has served as interim director since April when Kathy Deck stepped down, and as assistant director since 2007. Under Jebaraj’s leadership, the center will take on more of a hands-on role for economic development, in addition to its status as an economic information resource for the community, he said. The center also will work on more initiatives outside of Northwest Arkansas, a move Jebaraj said is in step with the university’s renewed emphasis on its land-grant mission to serve the state. The UA and the University of Arkansas at Pine Bluff are the only two land-grant universities in the state. “I’m really looking forward to being a resource but also a catalyst for economic development, working on issues and interventions throughout the state, especially in areas where we haven’t had much of a footprint,” Jebaraj said. The CBER has a 75-year history at the university. It coordinates or produces a number of informative events on economic trends in the area and nationwide. CBER collaborates with the Northwest Arkansas Council in Springdale to produce the Quarterly Business Analysis – which looks at key economic trends, projections and issues facing the state and NWA economies – and the annual State of the NWA Region Report, in addition to research papers that include economic impact studies and labor market surveys. CBER also produces the Skyline Report, a biannual real estate analysis sponsored by Arvest Bank, in addition to the Arvest Consumer Sentiment Survey, an annual report published each fall, examining statewide consumer attitudes. CBER’s next annual Business Forecast Luncheon is planned for Jan. 26 at the John Q. Hammons Convention Center in Rogers. Michael Milken, philanthropist, former financier and chair of the Milken Institute, will serve as keynote speaker. Milken also served two years in prison and was fined $600 million in the early 1990s for racketeering and securities fraud. The center has three full-time employees and 15 part-time student staff. However, with certainty now in the leadership of the center, Jebaraj plans to beef up staff. He earned a bachelor’s degree in economics and international relations from the UA in 2007 and a master’s in public policy from the UA in 2011. “During his more than 10 years at the center, Jebaraj has been instrumental in creating and executing economic studies for clients such as the Arkansas Economic Development Commission, the Northwest Arkansas Council, the Walton Family Foundation, Arvest Bank, the University of Arkansas and many others,” according to a press release from the UA. Jebaraj was named one of Talk Business & Politics-Northwest Arkansas Business Journal’s Fast 15 and one of Arkansas Business’ 20 in their 20s in 2015. He was also a member of Leadership Arkansas Class VIII.